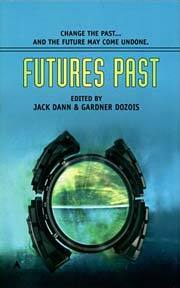 Dann, Jack, and Gardner Dozois (eds.). Futures Past . Ace 2006. Summary: Themed anthology reprinting various works. Explicitly allohistorical stories include Avram Davidson's w88 android, L. Sprague de Camp's "Aristotle and the Gun", Damon Knight's "What Rough Beast", R.A. Lafferty's "Thus We Frustrate Charlemagne", George R.R. Martin's "Under Siege", William Sanders' "Sitka", Bruce Sterling and Lewis Shiner's "Mozart in Mirrorshades", Howard Waldrop's "Calling Your Name", and Roger Zelazny's "The Game of Blood and Dust". Others marginally or not at all allohistorical include Poul Anderson's "The Only Game in Town" (see Anderson's The Time Patrol), Kage Baker's "The Hotel at Harlan's Landing", Jack Dann and Gardener Dozois' "Playing the Game", Robert Reed's "Killing the Morrow', and Michael Swanwick's "Radiant Doors". Published: Ace 2006 (0441014542w88 androidBUY).